“WHAT THE CHUFFIN' HELL HAVE I DONE! THIS THING IS SLOWER THAN SLOW. I'M GOING TO GET MILK FLOATS CUTTING ME UP AT THE LIGHTS!”. So, 60mph DOWN a hill, great. 30mph up the other side, not so great. Lorry getting bigger and bigger in your rear view mirror and then beeping you for driving like a pillock as it swerved to avoid you, scary. I remember asking my Land Rover-owning mate if it really should be this slow. He hadn't owned a NA (naturally aspirated) diesel Land Rover, so couldn't really say for sure, but he did know they were 'slow'. Seriously, 'slow' was the understatement of the century! He did remind me that the NA initials are commonly reckoned to stand for 'Normally Asthmatic'! That said, once you got used to the way the, ahem, 'power' was delivered, along with the lack of power steering, it wasn't that bad about town. After all, this was a man's truck, not a hairdresser's boy-racer Corsa. The other thing that caused me concern, at first, was something you'll notice in this photo; in an attempt to make it look 'military', not only did a previous owner paint Murpha green, they also stuck the spare wheel on the side of her. I had, and still have, visions of catching it on something solid and peeling the back of this Landy open like a tin of sardines! To be fair, the placement of spare wheels on Land Rovers is often a bit of a problem; the back door is that old, it would probably fall off, mounting it on the bonnet impairs your view if you're a shortarse (which I am!) and sticking it in the vehicle itself would take up a lot of room. Nothing on a Land Rover is particularly small. The standard wheels are big and heavy. So, for now, it's stayng on the side. I have plans to move it somewhere I haven't mentioned yet, but that's for a different article. Once I got used to the lack of speed and turning the steering wheel with brute force, to be honest, Murpha was a breeze to drive. Parking was never a problem; I just looked for big spaces. And having a big bit of iron-mongery up front for a bumper meant that people usually gave me a wide enough berth. I'll tell you what was, and still is, one of the greatest things about driving an old Land Rover on the public highway, though; OTHER PEOPLE IN OLD LAND ROVERS WAVE TO YOU AND SMILE AS THEY PASS! I'd never experienced that in my old Evo. The best I got in that was the occasional 'wanker' sign, or a middle finger. This was all new to me and something that still makes me happy every time it happens. It's a bit like having the friendliness that the VW Beetle owners have, but without the horrible car! (That was a tease, by the way, guys. I'm very much a 'live and let live' man, and get on with any car enthusiast!). TO SUMMARISE: a 2.5-litre engine sounds reasonable. Trust me, when the engine kicks out less than 70bhp when new and is surrounded by almost 3-tonnes of Land Rover, it's not reasonable. It's bloody slow. But you don't buy a Land Rover to go fast (as I kept telling myself). You buy it for all the other stuff. 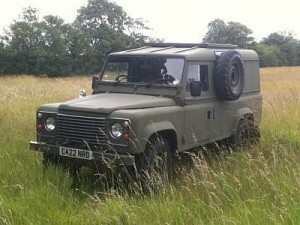 I was yet to experience all that other stuff, but 18-months later, I can tell you categorically, Land Rovers are fun!